Kris grew up in Brooklyn, studied cello, and played with local jazz bands and folk singers. After spending a long winter in Maine and learning to play guitar and fiddle, she moved to Boston joined the folk scene. 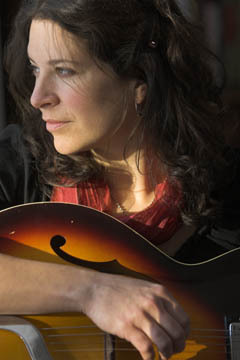 She won first place in the Telluride Bluegrass Festival’s Troubadour Competition in 2001. Whether she’s singing a delicate ballad or a new wave romp, her music radiates wit, intelligence, and charm.